Welcome to FunkieFinds.com the best place for Hand Painted Furniture on the web! 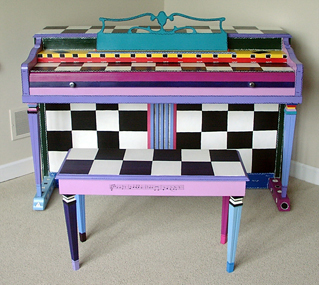 Welcome to Funkie Finds your hand painted furniture destination on the web. Combining the arts and beauty we provide custom hand painted accessories and unique art design. Out items new and old reflect your design needs. On these pages you will find art with many items featured that have won numerous awards at juried art shows across the country. Our products design philosiphy is that you should have unique work with that reflect your personal design style. Based in the metro Austin area we specialize in transforming everyday pieces into beautiful and functional hand painted treasures. Feel free to check out our great gifts or request a commission piece. Please click on one of the pctures or the menu above to explore our site. Thanks for visiting and enjoy your stay!